myhomehelper is an award winning memory aid developed from personal experience and feedback from service users and carers in trials over 3 years. It comes pre-installed on a tablet device that has been configured to run the system optimally from the moment that you turn it on. A simple set-up system can be accessed by family members and carers to tailor the system to suit individual needs via the myhomehelper website, from anywhere that has access to an internet connection – be that at home, work or even on holiday. It has been designed as an “always on” system and once set-up only needs to be maintained when new activities, appointments or photos etc. need adding. myhomehelper requires access to a Wi-Fi internet connection. Posted in Stress and Anxiety Help	| Tagged Calendar, Clock, Diary, Digital, Facebook, interaction, Memory., myhomehelper, News, Online, Photos, Reminders, Required, Skype. 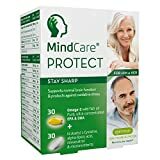 BOOST MEMORY, PRODUCTIVITY AND MOOD: Our popular supplement contains a powerful blend of Guarana, Ginkgo Biloba, CoQ10 and vitamins B3, B5 and B12 that can help you improve your memory, elevate mood, increase mental clarity, and even help protect you from unnecessary anxiety and early mental decline. TRUST IN SCIENTIFICALLY PROVEN RESULTS: The natural, high quality ingredients contained in this effective formula have been scientifically proven to help enhance memory, balance mood, increase mental focus, and improve daily performance. So if you think that dragging your tired limbs to the nearest couch every time you come home after work is not the best way to live life, you owe it to yourself to try this brain booster. TAKE BRAIN BOOSTER WITH YOU EVERYWHERE: With a highly practical cap and a slim, space saving bottle that can fit in your bag or purse, you can easily bring your powerful brain supplement everywhere you go, so you never miss a dose. SUITABLE FOR VEGETARIANS AND VEGANS: Containing only plant based, natural ingredients, this effective formula is vegetarian and vegan friendly. The bottle contains 60 easy to swallow capsules. OUR PROMISE TO YOU: Brain Booster advanced CoQ10 and Gingko Biloba complex is backed by a full, 60 day money back guarantee: see results within 60 days, or get a full refund. With nothing to lose, order yours today and start feeling the difference. The natural, powerful ingredients in this high potency formula will help improve your memory, increase your alertness and support you in fighting the fatigue that comes from long days, project deadlines, intense studying and more. Brain Booster comprises a blend of high quality, natural ingredients, such as Ginkgo Biloba, CoQ10 B Vitamins, which have been scientifically proven to help enhance mental performance, maintain a balanced mood and a positive attitude. Brain Booster is a safe and reliable food supplement for every hard working, modern-day individual, busy mum or university student, who want to be able to offer their best & feel good every day. On a vegetarian or vegan diet? Brain Booster is for you. Engineered with natural, plant based ingredients (no animal products), you get peace of mind with every capsule. CAUTION: Contains caffeine. Not recommended for children, pregnant or lactating women.